Will you be my Facebook friend? Tim Chester looks at the benefits and dangers of the rise of social media. In just a few years, Facebook has gone from nothing to a major feature of modern life. There are over 500 million users, half of whom use it on any given day. There is much that is good about this…social networking brings many benefits…but what about the dangers? Image, identity, idolatry and self–promotion are just some of the challenges that social networking can present. Dr Tim Chester looks at these issues pastorally and biblically, in his usual clear and candid manner. He asks pertinent questions to help us tackle them head on. 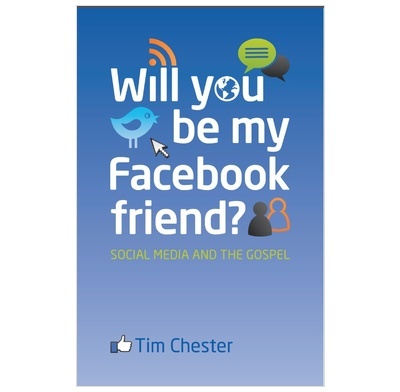 This week I read this very short book written by the ever-insightful Tim Chester of The Crowded House Sheffiled and Porterbrook network. It is an eye opening, heart piercing and in many ways scary read that offers very timely advice as to our dependence on social media. Some of the statistics in this book are terrifying, for example Facebook was mentioned in a third of all divorce proceedings in 2011. The average person spends more than 20 hours a month on Facebook, nearly a whole day every month. All the way through he advises that despite all its virtues Facebook is very dangerous, it is the classic trajectory of idolatry, that when a good thing becomes an ultimate thing it does serious damage. If you are a Facebook user I would definitely suggest reading this book, it takes about 30mins to read and is real food for thought (half your Facebook browsing time). As a result of its challenge I felt compelled to close my Facebook page, however let each one make up their own mind but let’s not continue blindly down a potential destructive path that exchanges the real for the virtual and the deep for the superficial.